As we start transitioning from summer to fall we always think about our wardrobe… We put away our sandals, cover-ups and straw hats and pull out our boots, sweaters and jeans. But I’ve been thinking a lot about the easiest way to prepare my skin for the cold, dry weather that’s ahead. 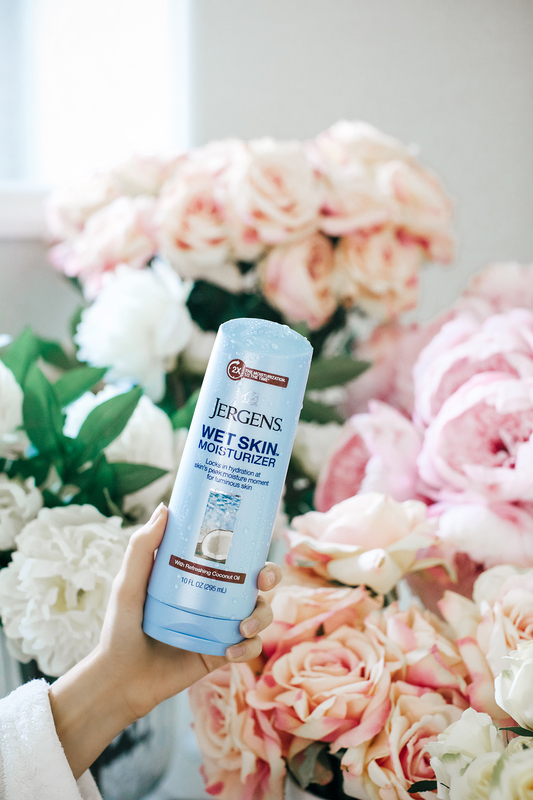 If you’re a long time reader then you’ve heard me talk about Jergens products before (I’ve been using them since I was in high school! It’s a brand I know and love!). That’s why I was so excited when I received product from Jergens Wet Skin Moisturizer line! These products have me falling in love with Jergens all over again. I’ve been using the Wet Skin Moisturizer with Refreshing Coconut Oil, and it’s such a timesaver if you’re always on the go! You simply apply it to your wet skin right after you shower. It immediately absorbs, then you just dry off normally and that’s it! I used to rarely moisturize after I shower, because it would take forever for the lotion to absorb completely. But this is such an easy way to moisturize because it glides right onto wet skin (when skin is most receptive to moisture) making it the perfect moment to lock in hydration! Have you guys tried it? What are your thoughts? Brought to you by Jergens. I’ve heard about this and am interested, especially since the only time I remember to moisturize is right when I get out of the shower! I’ve heard so many great things about this moisturizer! I definitely want to try it out! I love Jergens wet skin moisturizer! I have super dry skin in the winter so I always bust this out. The husband who does not like lotion at all will even use it. Win! I can’t wait to try this! Even living in SoCal, my skin still gets dry in the winter. Ah! I need to try this moisturizer! I also hope you share the building process with us! I can’t wait to see! Love this product! Your bathroom looks so dreamy!! Yes!! Thanks for the suggestion :) I use strip lashes that I glue on every day! Oh I absolutely love this stuff! It leaves your skin feeling so soft when you get out of the shower and it smells amazing! I sometimes use their Ultra Healing Lotion ( https://beautyessential.net/best-lotion-for-dry-skin/ ) and it is as good as they say. At least for me it works. When my skin (especially the one at my soles) gets kind of dry and unnatural in the cold seasons, I apply every day a little bit and it works MIRACLES! The Healing Lotion contains vitamins, Cetearyl alcohol, glycerin, and dimethicone, so it can’t anything but healthy.